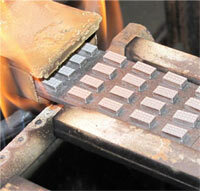 Most refractory based electrical contacts are produced by means of powder metallurgy. High conductivity metals such as silver or copper are blended with metals that demonstrate the ability to withstand severe electrical and mechanical forces. Depending on the required composition, one of three processes is generally employed. Press-Sinter-Infiltrate (PSI) generally provides the highest density material, while the Press-Sinter-Repress (PSR) process is required for certain compositions. In some cases, a Press-Sinter (PS) only process is appropriate. Regardless of the process, the initial production step involves the blending of powders, along with additives. Prior to mixing, all powders are certified for purity and reviewed for correct particle size and distribution, apparent density, and flow characteristics. Once certified and released to production, powders are mixed based on engineering specifications for a given material composition. Compaction presses ranging from 14 to 250 tons are used to produce basic contact geometries. Pre-mixed powders are fed into a die cavity, then upper and lower punches combine to create the contact face and back detail. The "green" compacted part weight, thickness, and density are closely monitored using SPC techniques. These part properties are critical to final composition and dimensional control. When processing refractory compositions, in addition to driving off binders and lubricants, sintering in a high temperature furnace allows the creation of metallurgical bonds between the powder particles and the creation of a "refractory skeleton" that can be infiltrated or repressed. Typically, after sintering, contacts are at the final dimensional requirement, eliminating the need for expensive machining. 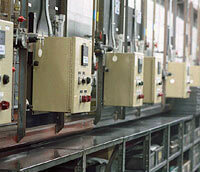 Furnace atmosphere as well as time and temperature are closely controlled throughout this process. Furnace Temperatures and Atmospheres are Monitored and Controlled by State-of-the-Art Optical Controllers and Mass Flow Meters. Outputs are Computer Monitored and Recorded. In the production of refractory based electrical contacts, infiltration or repressing is required, depending on the desired material composition. 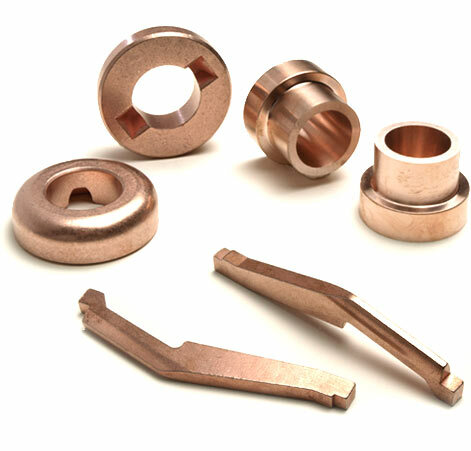 During the infiltration process, the sintered contact is fed through a furnace with a carefully controlled pre-cut slug of pure copper or silver. This slug of copper or silver is placed on the "serrated" side of the contact and, under time, temperature, and atmospheric control, infiltrates the previously formed contact "skeleton". A repressing or coining operation is used to attain final density for other types of materials such as silver graphite, silver tungsten-carbide graphite, or copper graphite. CTI customizes the surface of contact tips in several ways. 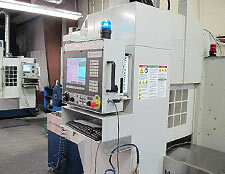 CTI strives to accomplish design requirements with "molded-to-size" configuration. When this is not possible, CTI has a full line of CNC and conventional machining equipment to satisfy the most demanding contact designs in the most efficient manner possible. Using a salt bath, the refractory metal is etched from the surface of the contact. Generally speaking, a light etch is applied to aid in customer applications where a highly conductive surface is desirable, such as in circuit breaker switching duty requirements. Etching is also helpful in creating a surface that is easy to attach to when welding or brazing. CTI will choose an appropriate braze alloy and, through a thermal operation, apply the material to the backside of the contact for later attachment. 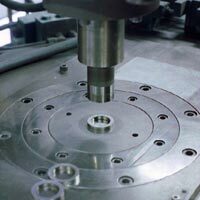 This finishing operation by CTI allows the customer to then easily attach the contact to their base by conventional or fully automatic assembly equipment. This process accomplishes many of the same things as refractory etching but is employed where contact materials typically contain graphite. Through a carefully controlled thermal operation, the graphite is removed from the targeted surfaces, leaving behind a layer of high conductivity material which is easily attached to contact supports. Contacts receive a final cleaning prior to shipping. Cleaning is accomplished ultrasonically or more typically by tumbling in a specific soap and water solution with hardened media. From Simple to Complex Geometry, Contact Technologies Produces Custom Electrical Contacts that Meet the Demands of Customer Applications. A Variety of Shapes and Sizes for Contact Requirements are Possible because of Powder Metal Technology.